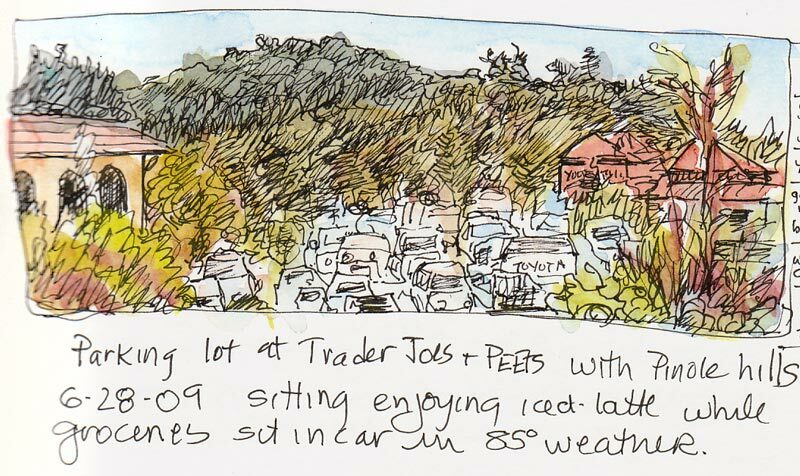 It was 86 degrees but quite comfortable in the shade of an umbrella, on the patio at Peets Coffee in Pinole, where I sipped my iced latte and sketched this view of the parking lot and hills behind it. I’d dropped off a key at my son’s house nearby and then done my grocery shopping at Trader Joe’s and decided I deserved a delicious icy reward next door at Peets. 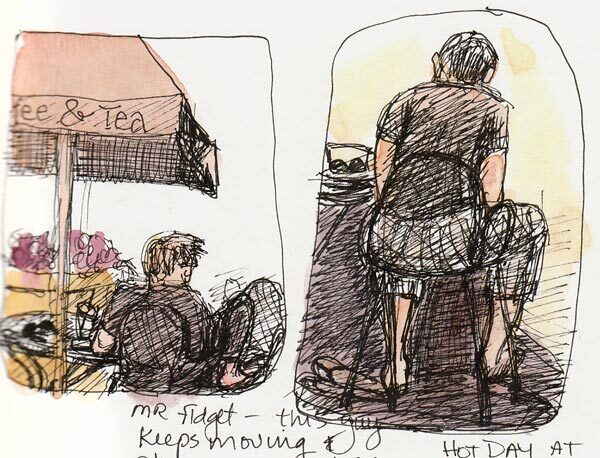 This guy never stopped moving, feet up on a chair, knees up, leaning sideways, feet under chair, flip-flops on, off. I was so happy when he put his feet back on the ground so I could finish the sketch. It felt good to slow down on a busy day and sit and draw, but when I checked my watch I realized my groceries had been baking in the car for nearly an hour. I packed up and added watercolor at home. I really like the style and the colors you used in these sketches, Jana – and the iced latte sounds great – you definitely deserved it. I hope your groceries survived…..
Hi Jana, great sketch. Have a wonderful weekend.